I initially soaked the beans and then started cooking them. Unfortunately, I didn’t turn the heat down and they burned in my nice stainless steel pot and left a black bottom. (BTW, boiling water with a healthy dose of Dawn Dish Detergent for 5-10 minutes really made this easy to clean!) Not wanting to do this again and it being later in the evening, I took more pinto beans, washed them and put them in a crock pot with water, salt and several cloves of garlic. Set it on high for a couple hours and then low before I went to bed. Wonderful perfectly cooked pinto beans in the morning!!! Rinse the beans and pick them over, taking the odd wrinkled ones out. 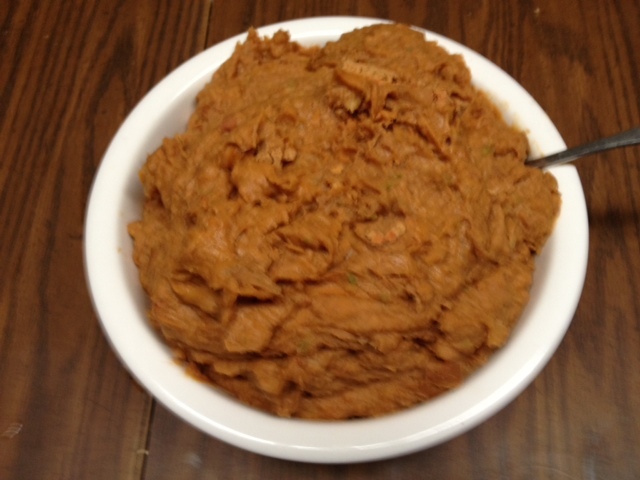 Refried Beans ready to be served with tortillas or as a side dish. Put in a large crock pot with 10-12 cups of warm water. Add a generous teaspoon or so of salt and the garlic. Put the crock pot on high for a couple hours and then on low overnight. I start this early in the evening. The next morning, drain off most of the liquid, leaving enough to make it a thick soupy mixture. Heat the oil in a large frying pan and saute the onions, jalapenos, carrot, and another clove or two of garlic if desired. Add the beans, tomato paste, chili powder, and cayenne pepper. Mix thoroughly and heat through stirring constantly for a couple minutes. Mash the beans with a potato masher or use an immersion blender (that’s what I did) pureeing until as smooth or chunky as you want it. Season with more salt if desired. Serve with tortillas, salsa, lettuce & shredded cheese. I also serve as a side dish with shredded cheese and/or salsa.